Hi People, this is my second blog, even though Blogging has been popular for like 15 years now, but for some reason, never quite got into it (I didn't do cell phones or Facebook until 2014, the year Mother Janet was taken from me by an aggressive cancer, my mother and I were what more socially apt people call reclusive). 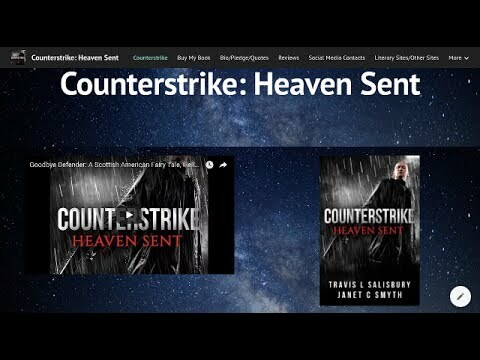 I created this blog as a continuation of the two cancer support pages I started on Facebook last year, and to help me promote and sell the book Mother Janet and I spent the last four years of her life working on, Counterstrike: Heaven Sent. Born Eugene, OR, Feb 7. 1980. Parents Jeffrey Salisbury And Janet Smyth (D. 2014) Divorced 1982. Grew Up As Trailer Trash In Coos Bay, OR. 36 Y.O. College Dropout, Racked With Arthritis, Minor Mental Disability, Never Married, Never Employed, Thought I'd Give A Stab At Copy Editing. Had Two Brief Stints Of Living In Yerington, NV, The First Of Which Was While The Original Author, Mother Janet, Was Away At A Hospital In Reno, NV, Being Devoured Like A Swarm Of Locusts By Stage IV Metastatic (Had To Look That Word Up) Ovarian Cancer, Only One Month After We Moved, Spotting Like A Cheetah, Shriveling Like A Raisin, Mewling Like A Goat, And Hissing Out The Infamous Cancer Death Rattle On December 03, 2014, Would You Like To Know More? One lonely day in Kansas farm country, a passing college professor encounters her biggest “surprise package” ever, a too handsome, too intelligent, too faithful, battered and mangled FBI agent and his equally battered and mangled government issued car at the side of the road. Kate soon finds herself enmeshed with Agent Gareth's dark world of spies, terrorists, hackers and corrupt bureaucracies, and her planned road trip and career move ultimately derailed. However, in the middle of this unforeseen mess and intrigue, Kate and Gareth together discover their similarities, and not their starkly different class backgrounds and upbringings. Together, the unlikely pair discover a deep and lasting companionship, a binding faith in their God, a passion for fun and adventure, and more importantly than not, a burning will to survive against all odds, when the evil machinations of terrorist leader Klaus Vogle, along with bad office politics, and the unscrupulous scheming of Gareth's industrial tycoon father, Andrew McFadyn. Thus begins, the modern tale of a chivalrous knight, and his fair wise maiden. Follow agent Gareth “Dru” McFadyn and his “random” traveling companion, Kate Greenwood, on their odyssey of love, adventure, faith, morality, and patriotism. Follow them left, follow them right, follow them to heck and back, follow them to the end, and read this book. For once in your lifetime, take a risk and give it a shot, who knows, you might actually happen to like it. 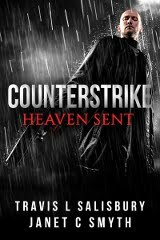 Counterstrike is a gripping story that defies description and genres. Mother Janet Smiles Proudly Back At The Official Completion Of The Family Project, Some Two And A Half Years After Her Death And One Year After The New Author Rebooted It, Now Where's My Damn Royalty Check? Travis Logan Salisbury c2016. Simple theme. Powered by Blogger.